may be granted and for what reasons. 1. If your product arrives damaged, we will issue a full refund for any item that arrives damaged due to handling by our staff or by the shipping carriers. 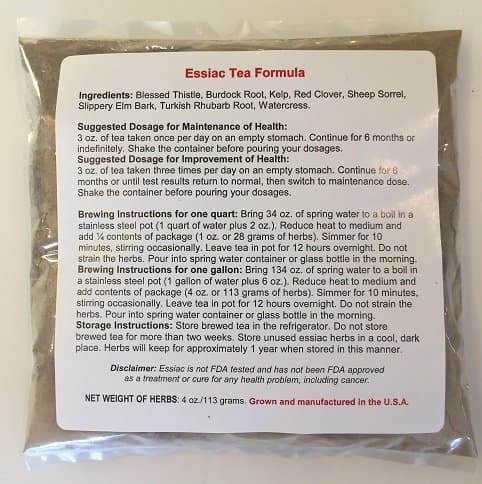 To receive a refund for bulk essiac tea that arrived in damaged condition, please notify us within one week of receiving your order. Click on the link to contact us and describe the problem so that we can approve the refund for your essiac tea. Once we receive the returned product, we will immediately issue a credit on your payment. 2. If you decide to cancel your order before it's shipped, the order will be refunded 100%. Please note: If you've opened your package and the bag(s) have been opened or otherwise tampered with, you won't be eligible for a refund. Not liking the essiac tea or deciding you don't want to use it are not grounds for a refund. However, if you believe that there is something wrong with your product, contact us and, if approved, we will offer you replacement at no extra charge. 3. International orders. We are not responsible for any orders that don't arrive to you because they are seized by Customs or other government organizations. BEFORE ORDERING, PLEASE CONFIRM WITH YOUR COUNTRY'S REGULATING BODIES THAT THEY WILL ALLOW ESSIAC INTO YOUR COUNTRY. You may want to tell them that essiac contains the eight herbs: blessed thistle, burdock root, kelp, red clover sheep sorrel, slippery elm bark, turkish rhubarb root, and watercress. However, we do not write these ingredients out on the customs slip. Although we will never ship to a country that we know will refuse the essiac, we are not able to learn and keep up-to-date on the hundreds of countries that order from us. If your package is seized, you will not receive a refund, so purchase at your own discretion. Customers are solely responsible for any fees or duties to receive our products into the destination country. The same terms and conditions that apply to our domestic orders apply to international returns. Please do not ask us for a refund for bulk essiac tea if you didn't follow the instructions on advised usage including taking it continously for six months! !